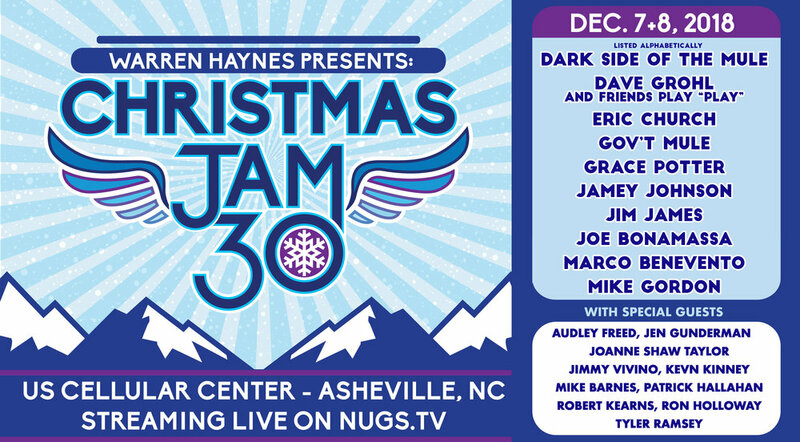 The 30th Annual Christmas Jam will be available via video webcast and is on-sale now. Pre-Order now at http://2nu.gs/XmasJam30 then join us live on December 7+8 from the U.S. Cellular Center in Asheville, NC with Dave Grohl and friends play "PLAY," Eric Church, Gov't Mule (including Dark Side of the Mule), Grace Potter, Jamey Johnson, Jim James (of My Morning Jacket), Joe Bonamassa, Marco Benevento and Mike Gordon (of Phish). Get discounted 2-show packages or order single nights in Std or HD from http://2nu.gs/XmasJam30. This year's webcast will once again benefit the Asheville Area Habitat for Humanity. For the 20th year in a row, proceeds from the Jam will go toward constructing energy-efficient new houses as well as purchasing and developing land for entire Habitat subdivisions.